The first screening will be on Friday, February 15 at 5:30pm featuring Van Gogh. There will be an opportunity for discussion following the first screening (around 7:30PM) at Meritage Bistro, on Carolina Way. Call Meritage, 828.526.1019, for personal reservations and mention Great Art on Screen. 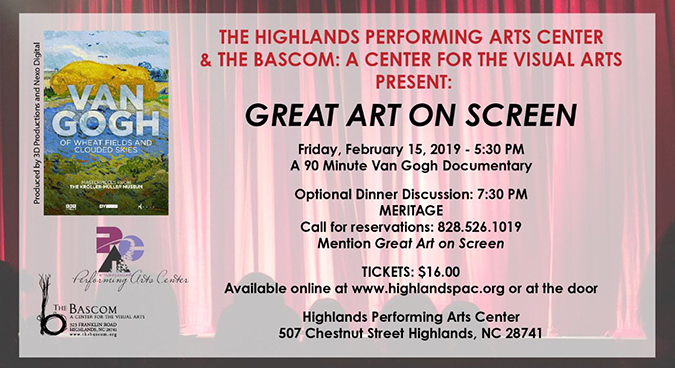 Tickets to the film are $16 and are available online at www.highlandspac.org or at the door – Highlands PAC, 507 Chestnut Street Highlands, NC.